In 499 B.C., the Ionian revolt broke out, namely the rebellion of several Greek regions of Asia Minor against the Persian rule. From among the Greek city-states only Athens supported the revolt. After several years of severe fights, the Ionian fleet suffered a devastating defeat in 494 B.C. at Lade and the revolt was suppressed by the army of Darius I, the King of Persia. In 487 B.C., the revolt in Egypt was also crushed. In 480 B.C., the son and successor of Darius I – Xerxes I the Great leading a 300-thousand army set off to conquer Greece. The land army was accompanied by 800-1200 (depending on the source) warships. The Persians went through Hellespont, Macedonia and a narrow pass of Thermopylae. Since the Persian army was approaching the city, the Athenians took shelter on the island of Salamis and the Persians captured their city. 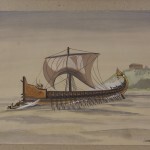 The Greek fleet (380 triremes) also took to the shore of Salamis. After capturing Athens, Xerxes I decided to march on Corinth – the last obstacle on the way to conquer Peloponnese. The attack was to be conducted from land and at sea at the same time. In mid-September 480 B.C., the Persian fleet called at the Bay of Phaleron located east of Athens. They delayed the attack waiting for Xerxes I. They planned to strike on 28th of September. The manoeuvres of the Persian fleet began during the night from 27th to 28th of September. First, 200 fast warships of the Egyptian squadron were sent around the island towards small strait near Megara to block the Greeks preventing their escape and attack their fleet from behind. The Persian fleet set off very carefully – to keep complete silence their oars were wrapped up in rags. Around midnight, the Phoenician warships within the Persian forces reached the island of Psyttaleia and put significant landing force down on the shore. Then the fleet of Xerxes I entered the Saronic Gulf and got into position between the shore of Attica and the Kynosura Peninsula on the island of Salamis. In this way, they blocked the strait on both sides of Psyttaleia (in the east between the island and Attica there were 138 galleys, in the west – between Psyttaleia and Salamis – 153 galleys) and encircled the Greeks. The Persian fleet formed three lines. The Persian formation on a very small area was very tight. Marching and arranging the formation lasted till sunrise. Meanwhile, the Greek leaders debating during the night were warned about the fleet of Xerxes I enter the strait. 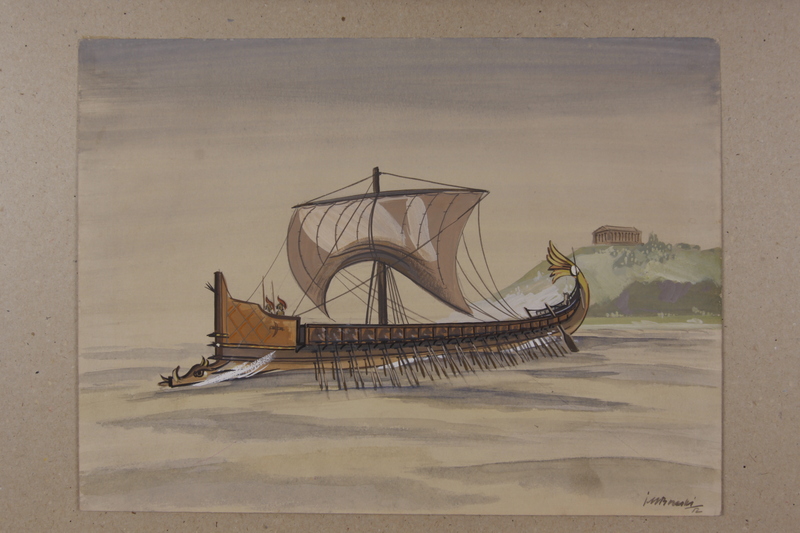 First, 46 triremes were sent to prevent the warships coming from Megara to attack from behind. At sunrise, other warships arranged themselves in battle formation. The Greeks employed file formation split into two lines. The Athens squadron was on the left (the Strait of Georgia – Ambelakos Bay), the Spartan, Corynthian and other – on the right (the Strait of Georgia – the Kynosura Peninsula). The Greek front was more flexible and less tight than the Persian one. Although the Persians outnumbered their enemy, the Greeks proved better manoeuvring, ramming and boarding skills. The battle began in the morning on 28th September. Both fleets were positioned at a distance of 1 nautical mile from each other. The Phenician right flank was first to attack, then the middle and the left wing (Ionians). The Greeks responded with attack of the left flank (Athenians), then the right wing (Spartans) and the middle (the Allied forces). One of the Athens triremes on the left flank rammed the galley of the Phenician squadron commander, Ariabignes who jumped onto the Greek warship to board it but was knocked down by hoplites. The Athenians stroke harder and employed ramming to confuse the enemy. In the centre and on the right flank fierce fight continued – ramming or boarding. The Persians did not know the basin very well, their crews were not so effectively trained and their formation was too tight which caused continuous pressing against the ships’ sides making manoeuvring impossible. Moreover, the galleys from the second and third line, trying to support the attack of the first line fiercely forced their way through them, knocking against the oars of the first line warships fighting with the Greeks. 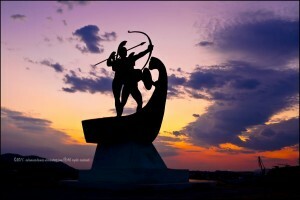 Xerxes I – with his staff and court – was observing the battle from Ajgaleos mountain of the shore of Attica. The Phoenicians were first to surrender under the Athenians attack; some retreated in panic to the shore of Attica, and some moved towards the desperately fighting centre of the Persian forces. The confusion within the Persian centre and left wing increased even more, when the first victorious Athenian triremes followed the Phoenicians. Seeing this, the Greek centre and right wing attacked with amplified force. The double attack: from the side and the front was something the Persians could not resist. When ramming of the enemy warship failed to work, after boarding – armed hoplites began to storm the enemy. Three formations of the Persian centre and left wing grouped together and began to retreat in panic towards Psyttaleia. The Greeks gave chase. The Persians run away to the two narrow passes around the island where even greater chaos broke out. The Persian warships left there before the battle barely managed to retreat towards the end of the Straits of Salamis and were followed by the Greek right wing forces. The Persians run away to the Bay of Phaleron. The Greeks chased them till the Port of Piraeus and then returned to Salamis. The Battle of Salamis had significant strategic importance. The victory became the turning point of the war. Although the Persian fleet lost only 1/6 of their forces, the troops retreated by Xerxes I gave ground to the Allied navy. The new situation allowed the Greeks to take offensive actions at sea. The Persians could no longer conduct joint campaigns on land and at sea. The military success was also psychologically significant since it strengthened the previously weakened Greek belief in the meaning of war. In the first half of 15th century, the opposition inside the Teutonic State intensified. In 1440, its representatives established the Prussian Confederation which triggered off the anti-Teutonic uprising, in 1454. The Polish Kingdom supported the insurgents. The Thirteen Years War (1454–1466) began. The most fundamental premise of the Polish-Teutonic conflict was Poland’s attempt to regain eastern Pomerania with Gdańsk and the mouth of the Vistula river seized by the Teutonic State at the beginning of 14th century. It was indispensable for Poland to guarantee their free economic development. 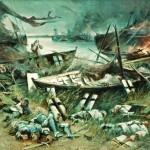 The Battle of Vistula Lagoon was the largest naval battle during the Polish-Teutonic struggle and at the same time, one of the two crucial battles of that war in which the balance was swinging from one side to the other. In April 1463, the Teutonic commanders decided to take offensive actions in the delta of the Vistula river; the town of Gniew was to play the basic role in the operations. Meanwhile, the Polish side tried to block the Teutonic Knights supply routes by capturing Gniew. At the end of July 1463, the Poles began to besiege the Teutonic fortress. In September, the Teutonic Order began the counter-attack. On 9th September 1463, the Teutonic fleet sailing from Königsberg (today Kaliningrad) towards Gniew besieged by the Polish mercenaries and the fleet of Gdańsk and Elbląg, was blocked by the Gdańsk fleet on the Szkarpawa river near the village of Żuławki. The Grand Master, the commander of the fleet, decided to wait for the land troops to attack the Gdańsk fleet from both sides. The relief, however, failed to come and the Poles strengthened their position with reinforcements e.g. from Elbląg. Being afraid that the Elbląg warships could enter the Lagoon and block the mouth of the Szkarpawa river, on 13th September, the Teutonic fleet retreated to the Lagoon. They stopped near Tujsk and a day later, they entered the Lagoon and moved towards the north and north-east of Elbląg. Meanwhile, a group of warships from the Elbląg fleet commanded by the former Gdańsk corsair Jakub Vochs, entered the Lagoon on 13th or 14th September. Moreover, on 14th September, the Gdańsk fleet, previously blocking the Teutonic Knights in the Żuławy region, began to sail towards the Szkarpawa river. Near Tujsk, the Gdańsk and Elbląg fleet joined forces. Seeing the Polish manoeuvres, the Grand Master withdrew the rowing ships to the east near Nadbrzeże – Suchacz region. They were protected by the sailing ships which were attacked by Vochs. Unfavourable wind and numerically superior Teutonic Knights made him get into trouble only to be saved by the Gdańsk forces. The Teutonic warships returned to their leading forces. The group of Vochs was included into joint Union navy. Together with the Gdańsk forces, they blocked the Teutonic fleet trying to head to Königsberg, and after a few hours the blocking warships captured in a fierce fight three Teutonic warships coming from Königsberg. The Teutonic warships anchored near Kamionek Wielki – Suchacz region for the night. They were crowded together in one place and due to wave movement they continued to relocate, which made it impossible to manoeuvre effectively. The wind pushed the warships towards the shore. This is how they managed through the night. On 15th September, the morning mist enabled the Union warships to take positions unnoticeably. As many as 44 Teutonic warships with 1500 mercenaries supported by 350 seamen faced 30-32 Gdańsk and Elbląg warships with 1200-1250 Polish and Gdańsk mercenaries supported by ca. 220 seamen. The Polish warships formed a crescent; the Gdańsk fleet was on the left, north-west wing, and Elbląg fleet on the right, south-west wing. The Polish commanders planned to encircle and destroy the Teutonic fleet, first by firing and then by boarding the warships crowded in one place. 1. The firing between both fleets lasting an hour or more until Gdańsk and Elbląg fleets approach the warships to board. The Polish side succeeded. Early in the morning, the Union navy warships approached the outside line of the Teutonic warships throwing boarding hooks and boathooks. Seeing that their warships cannot manoeuvre and fires and chaos flare up, the Grand Master lost his will to fight. Under the pressure of the Union navy the Teutonic warships of the outside defence line began to retreat tightening the formation and pushing the warships to the shore. As the chaos grew, the warships crushed ships’ sides, broke oars, crushed ships’ boats and crew. In such situation the Grand Master escaped by boat through a gap between the left wing of the Union navy and the shore and ran away to Königsberg. Just after midday, the Union warships pushed through the outside defence line and forced their way into the Teutonic forces. The Polish and Gdańsk mercenaries forced onto the Teutonic warships. Some Union warships were still fighting with the Teutonic ones, some gave chase to the fleeing ones and other began to tow the burning ships and extinguish the fires. This phase lasted till evening. The belligerent sides were waging individual battles and giving chases, often ending up on the shore. It is estimated that about 1050 mercenaries and seamen drowned and went missing. Others (as. 550) were captured. About 260 Teutonic Order troops escaped and survived. 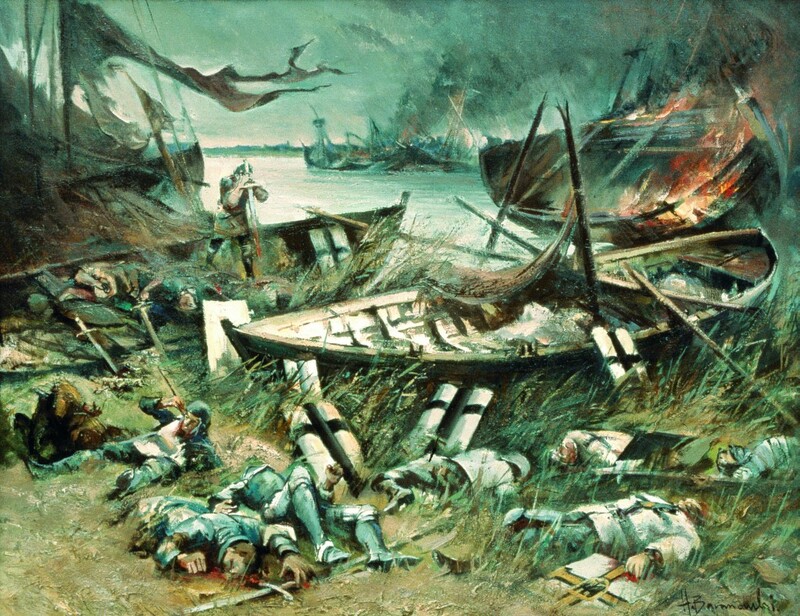 The Battle of Vistula Lagoon had significant impact on the further course of the War – it prevented the planned Teutonic offensive actions in the Żuławy region, resulted in the fall of Gniew and breached the blockage of the Vistula route. Since then, weakened Teutonic Knights abandoned offensive operations and only defended their assets. Joseph Wieslaw Dyskant, Fresh bay 1463, Bellona Publishing House, Warsaw 2009. The Battle of Oliwa (28 November 1627) was one of the episodes during the so-called war over the Vistula mouth, one of the encounters during dozens of years of the Polish-Swedish struggle from the first half of the 17th century. It was mainly caused by the expansive policy of Sweden which tried to transform the Baltic Sea into their own internal waters, and in consequence – to take control of all sea routes and the Baltic coastline with the most important ports and customs houses. In July 1626, after capturing Piława (Bałtijsk today in Kaliningrad Oblast) one of the main tasks for the Swedish army was to take control of the Vistula mouth. In order to force Gdańsk to give in, a group of Swedish warships began to bar access to the port from the Bay of Gdańsk. The Battle of Oliwa was an attempt to breach the blockage by the Polish fleet. From May 1627, 16 Swedish warships had been blocking the entrance to the port in Gdańsk but when autumn storms came, 10 of them sailed home. The remaining ones were to block Gdańsk till December. Perhaps, the Polish commanders knew about it and decided to make use of the significantly reduced forces. The first fire exchange which happened to be inaccurate, took place already on 26th of November; as a result the Polish warships sailed back to Wisłoujście and the Swedish ones sailed towards the Hel Peninsula where other warships of the squadron were stationed. During the night from 27th to 28th of November 1627, all Polish warships sailed outside the Wisłoujście Fortress and were divided into two squadrons – with five warships in each. The first squadron included the admiral’s warship „Knight St George” (later referred to as „St George”, "Be Virgo", “Flying Deer”, “Yellow Lion” and “Black Raven”; the second – “Aquarius” (vice-admiral’s warship), “King David”, “Noah’s Ark”, “Fireblaze” and “White Lion”. The swarm formation was employed as military tactics, IU. the warships of the squadron, like bees around their queen, grouped around the flagship. The Swedish squadron included 6 warships: the admiral’s „Tigern”, vice-admiral's "Pelikanen", "The Sun", "The Moon", "Unicorn" and "The parrot". About 6 in the morning on 28th November 1627, the Poles noticed the Swedish warships coming from the Hel Peninsula. The commander of the Polish fleet, the admiral Arend Dickmann fired the cannon as a signal to weigh anchor and set sail. „Kind David” was first to sail towards the Swedish warships. She was followed by „St George”. When „King David” recognized the Swedish admiral’s warship „Tigern”, she slowed down to make way for “St George” (the Polish admiral’s warship), “Flying Deer” and “Sea Virgo”. They were followed by warships of the second squadron: “Aquarius”, “Fireblaze” “Noah’s Ark”, and “White Lion”; despite the plan, „King David” did not join them. The Polish warships employed the swarm tactics preparing to board the Swedish admiral’s warship which changed the course and tried to enter the open sea. To stop her, the captain of „Flying Deer” tried to bar her way. When the distance between the opposing admiral warships shortened, Dickmann ordered to fire 4 bow cannons at the Swedish warship. „Tigern” responded with fire hitting the bow of „St George”. After short cannon-fire exchange, the warships pressed against their sides and huge fire from small cannons and hand weapon began. During the fight, the Swedish admiral Stiernsköld was fatally injured. The Polish musketeers continued accurate firing of the enemy warship, slaughtering the Swedish troops. The fighting continued because the Swedes put up fierce resistance, and direct fights with the use of firing weapon and cold steel took place. Then, as planned, „Sea Virgo” joined the battle coming towards to belligerent warships from their sterns, firing the muskets. The Poles of „St George” attacked again and some of them managed to reach the board of “Tigern”. At the same time, „Flying Deer” fired a broadside at the Swedish warship. The Polish commander did not know that on board of the Swedish warship there were some Poles. Moreover, „Flying Deer” hit „Be Virgo”, positioned near the stern of “Tigern”, and entangled the bowsprit in her rigging. At that time, lieutenant Olofsson of „St George” burst into Stiernsköld cabin, accepted his capitulation and captured the warship. Meanwhile, the Swedish „Pelikanen” approached the unprotected side of „St George”. The Polish troops quickly returned to their warship and after a while they fired a broadside at “Pelikanen”, which caused such big losses that the Swedish warship raised the white flag. However, when they caught favourable wind, they sailed away to the open sea. Then, Dickmann and the Polish seamen returned on board of „Mooch” to finish the battle. Unfortunately, when the admiral found himself on the stern of the Swedish warship, he was fatally shot in both legs. When the first squadron was capturing „Mooch”, the second led by „Aquarius” was fighting with „The Sun”. After cannon and musket fire, the crews of warships attempted boarding. The Poles, however, were not able to board “Solen” so the vice-admiral, Witte ordered “King David” to attack the port side of the Swedish warship. „King David” failed to follow that order; she approached the same side where “Aquarius” boarded the warship and tried to fire at the Swedes from there. 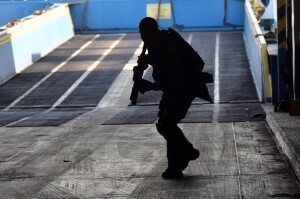 The commander of „White Lion” decided to help “Aquarius” and approach the Swedish warship. During the manoeuvring of the Polish warships, the Poles were attacking from “Aquarius” and the Swedes from “Solen”. In order not to let „Solen” escape, the Polish seamen continued to destroy her rigging. The battle was interrupted by a huge explosion – the skipper of the Swedish warship threw a burning tar wreath into the gunpowder chamber. „Solen” was destroyed and quickly sank; 23 Poles died. Saved were only those who managed to jump on “Aquarius” – the Poles and 32 Swedes. 14 Swedes and 3 Poles were recovered from water by the crew of „White Lion” which at that time reached the site. After scuttling of “Solen”, the other Swedish warships turned back towards the sea and set a course for Piława. A group of Polish warships gave chase, however, after some time, they returned to the roadstead. The Swedish blockage of the Bay of Gdańsk was breached; however, the Battle of Oliwa did not have significant influence on the course of the Polish-Swedish conflict. Eugene Koczorowski, Oliwa 1627, Bellona Publishing House, Warsaw 2002. The phenomenon of piracy had appeared and developed since the beginning of sailing. Communication by sea facilitated transportation of various types of goods, precious metals, arms and also people. For ages, however, merchant ships had been exposed to the attacks of the pirates who continued to be involved in illegal practices despite the risk of loss of life. Piracy exists also at present. Modern day pirates operate on the Indian Ocean, mostly within the Somali Peninsula, alternatively called ‘the Horn of Africa’. Every year, the piracy area extends and the ruthlessness and aggression of the activities increase. The occurrence of piracy in this area refers to destructive activities of the Civil War in Somalia (unleashed in 1991). In general, the pirates come from among former fishermen. They mainly attack merchant ships. The pirate crews have high-speed motor boats equipped with machine guns and grenade launchers. The tactics of those armed groups involve boarding which enables taking control of the ship. The second step is to extort ransom for the ship, cargo and crew. The navies of many countries (e.g. : the USA, India, France, Russia) work together to fight against pirate attacks by organizing various operations to rescue hostages and cargo. Unfortunately, the conducted operations fail to bring the expected results. According to data developed by the biggest shipowners, due to piracy the world economy loses $10bn every year.